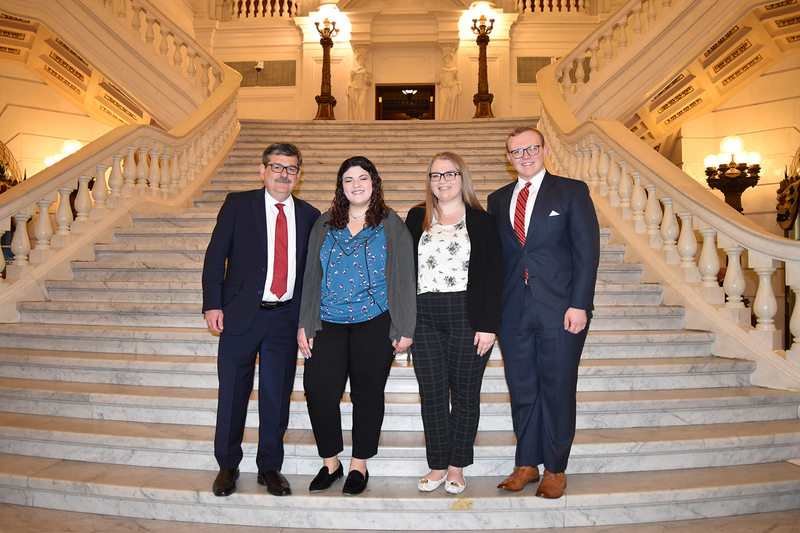 Three Westminster students and Dr. Edward Cohen, professor of political science, attend the Association of Independent Colleges and Universities of Pennsylvania’s (AICUPs) Student Aid Advocacy Day on April 9 in Harrisburg to advocate for student aid in private higher education. More than 200 students from 40 different institutions came together to ask legislators to protect the maximum PHEAA Grant award of $4,123 and to fully fund the Ready to Succeed Scholarship Program. Pictured from left are Dr. Cohen and political science majors Kaylee Brosius '21, Alexis Jones '22 and Matthew Causer '19.